What does the painting/print size actually mean? 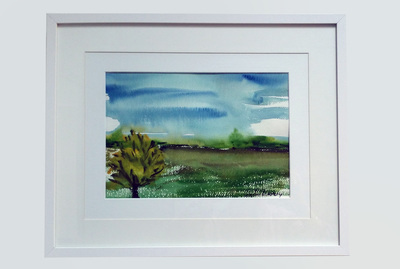 ​​My artworks are sized to suit ready-made frames available online or in a retail shop. On the rare occasion that an artwork is a custom size, the words 'non standard size' will be listed in the artwork description. In Australia, UK and Europe standard measurements are usually in centimetres and in the 'A series' of sizes, ie A4, A3, A2, A1, A0. In the USA and Canada standard sizes are usually in inches. Some frame retailers cater for both. (In the list of online retailers below, I've tried to include suggestions for online framers in the USA and Canada who say they stock 'A' series frames). 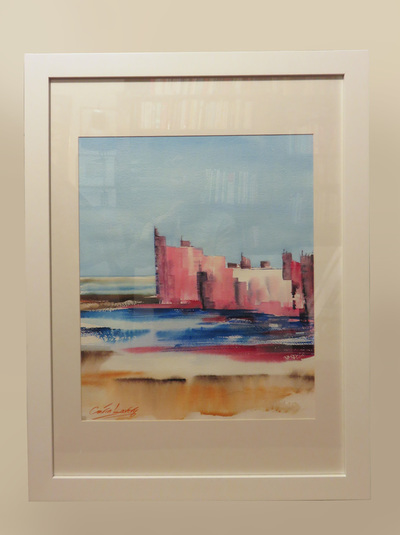 All sizes mentioned for my artworks, whether Original Watercolours or Limited Edition Prints are the required frame size. 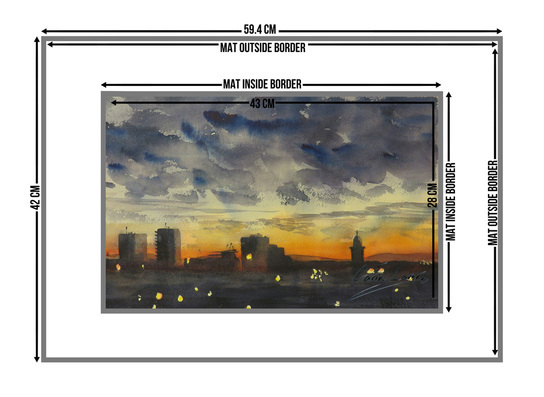 Dimensions stated for Original Artworks include the painting itself and the mat (see below for information about mats). Dimensions stated for Limited Edition Prints include the print and the white paper surrounding the image. The sizes listed are the frame size if you want to simply put the print into a ready-made frame, as is. 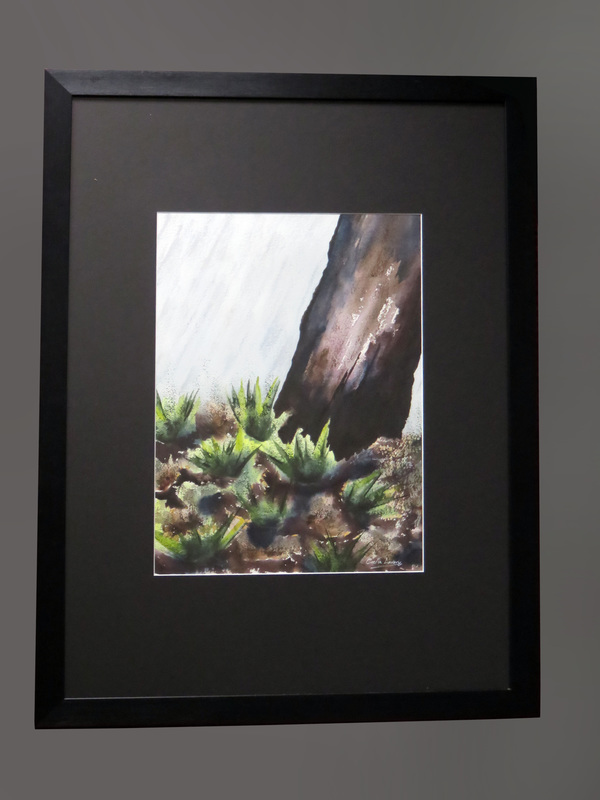 For example, an A4 print will fit an A4 frame; an 8" x 10" print will fit an 8" x 10" frame. If you want to mount your print you will need to buy a larger frame. Is the artwork supplied matted? A 'mat' is a piece of matboard, with a hole cut in the middle, to view the artwork, that sits over the painting, acting as a border and 'mounting' the artwork. It overlaps the painting so that the artwork doesn't fall out through the hole. 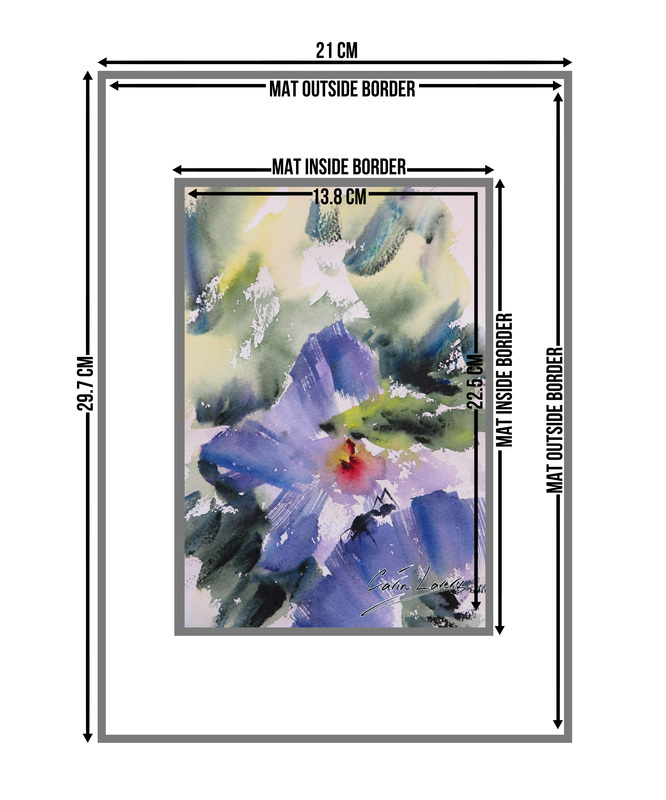 Apart from helping to display your artwork to its optimum, and looking more professional, the mat keeps it off the surface of the glass where condensation can occur and damage it. 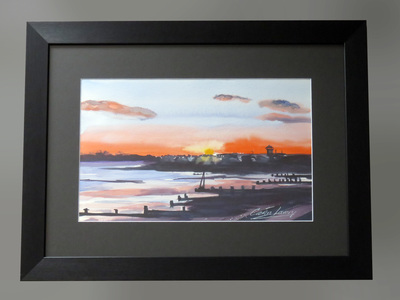 All my Original Watercolours are supplied matted with a white acid-free mat. The mats I supply are professionally cut to a size to suit the painting by specialist framers Frames Now. They are removable so that you can remat, if you wish with a different colour/shape/size, in case you want to be creative! Here are two examples of what your Original Artwork will look like. Your painting will be personally signed, the signatures in these examples are for illustration only. This Original Artwork fits into an A2 frame (59.4cm wide x 42cm high). This Original Artwork fits into an A4 frame (21cm wide x 29.7cm high). My Limited Edition Prints are supplied not matted (mounted). 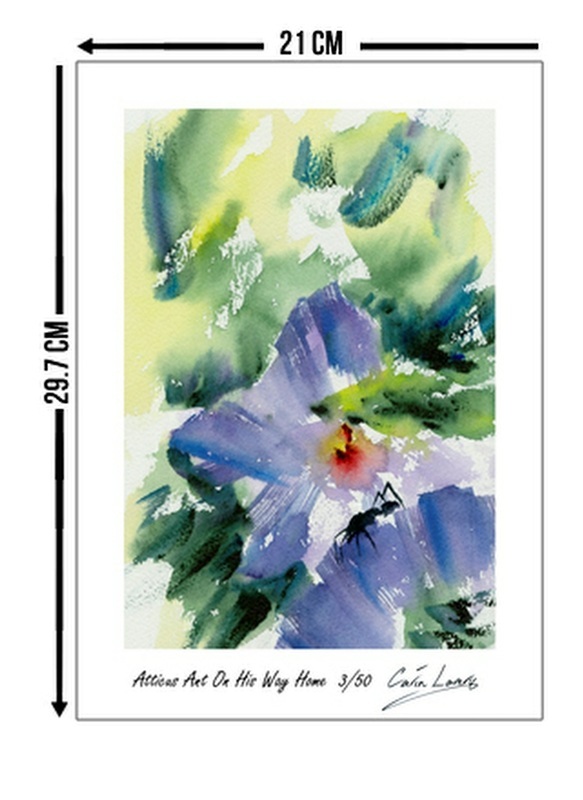 The print size includes the white border surrounding the artwork with the print name, edition number and my signature. You can take your print to a framer and choose whatever size, colour and shape you want and have a custom frame made. Here are two examples of what your Limited Edition Print will look like. Your print will be personally signed, the signatures in these examples are for illustration only. This Limited Edition Print fits into an A2 frame (59.4cm wide x 42cm high). This Limited Edition Print fits into an A4 frame (21cm wide x 29.7cm high). 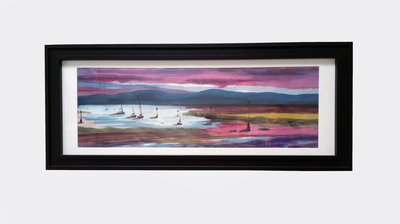 ​Do you supply your artwork framed? My artwork is not supplied framed as this is safer for shipping and enables you to choose a frame that suits your individual style and decor. 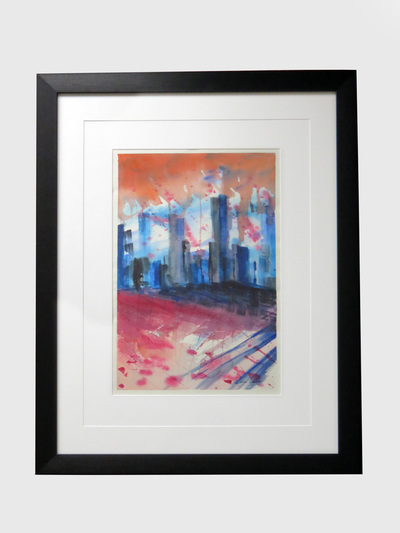 I recognise that some people may want a framed artwork, particularly if it's to be a gift. If you're able to collect from St Kilda in Melbourne, Australia, I can supply framed artwork; however this is not standard. In these instances, please contact me and I will let you know the cost of framing and delivery times. I will also charge a cost for time and other costs associated with framing. All artwork I frame for customers is in a plain black or white wooden or aluminium frame (like the examples below) - I will ask your preference within this range. My standard Returns Policy also applies to framed artworks. 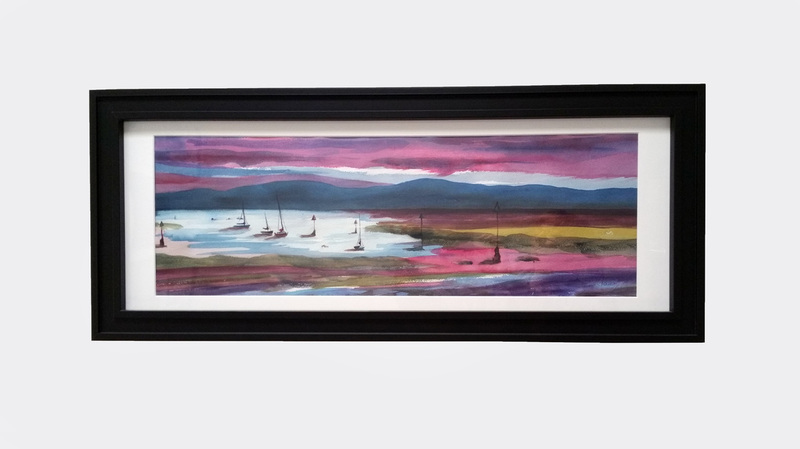 Where can I buy online frames to fit my Carin Lavery artwork? Some people want to simply pop the artwork into a ready-made frame, so I've taken care to size my artwork to fit into standard sized frames, available in Australia, the UK, (the rest of) Europe (the UK is still in Europe at the moment! ), the USA and Canada. In the rare instance that a print is only available in a size that is not standard, 'non standard' will be stated in the description. There are many online stores that stock ready-made frames; I've listed two in various countries, below, to try to help you. 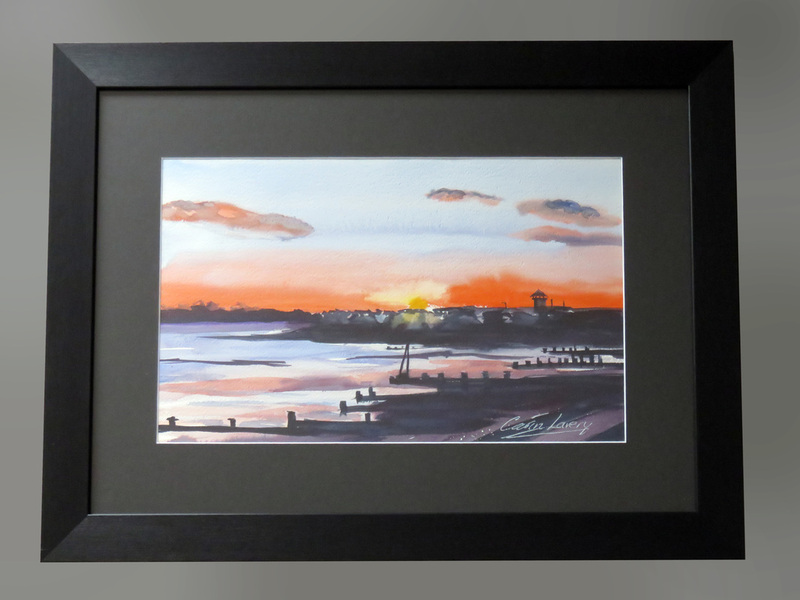 Whilst I've tried to only include online framers that stock standard-sized frames, stock available can change - and not all stock all frame sizes. For example, ready-made panoramic frames are hard to come by. (Frames Now in Australia stock frames that fit my panoramic prints). Alternatively, you can take your print to a framer to design a custom frame to suit your creativity! 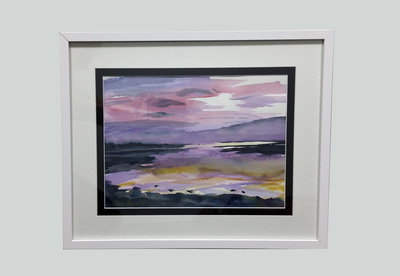 An Original Watercolour is a one-off painting, making a very special gift. I may reproduce the image in a different way, for example as a Giclée print or a greetings card; however, if you're the owner of the Original Watercolour, you have the only unique, original item. Each is personally signed by me (the signatures on the paintings in the Shop are illustrative only) and comes with a Certificate of Authenticity. 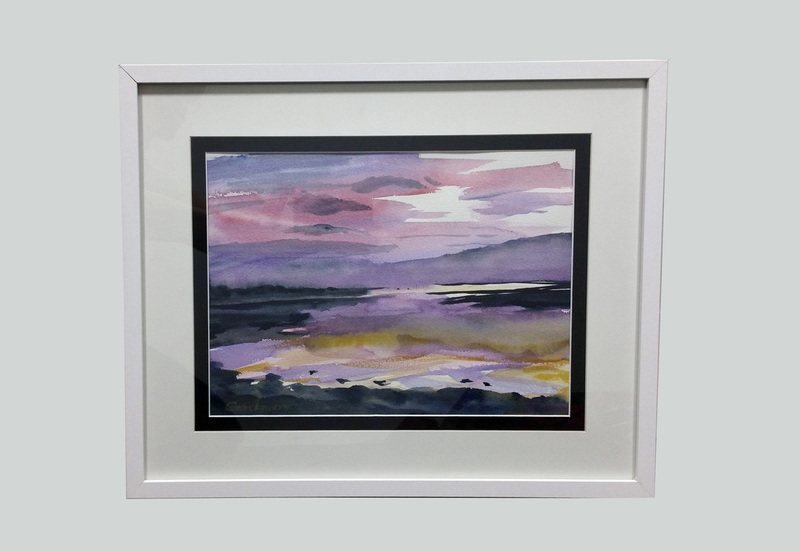 All my Original Watercolours are supplied professionally 'mounted', with a white mat (border), cut to a size that suits the size of the painting. They are not supplied framed as this is safer for shipping and allows you to frame to suit your style, room and decor. Each listing in the Shop includes details of the required frame size, which, in most cases are standard frame sizes in Australia, UK and Europe. If this isn't the case, the painting details will include 'non standard size'. Some of the frame sizes are also available in the USA and Canada; however, please check before purchasing. Giclée prints are of superior archival quality, light fastness and stability. They make an affordable, high quality present, or gift for yourself. Limited to a maximum of 50, there will only ever be a maximum of 50 in the world, making them extra special. All my prints are created from my original watercolours. If you can't decide which one to give, you can also send a Gift Card with different price points. I may use the image in a different way at some time in the future, for example for greetings cards; however, when the 50 Giclée prints have been sold, it will not be possible to buy one. They are a versatile gift idea as, whenever possible, my prints come in standard frame sizes available in Europe, UK, Australia, the USA and Canada. They are not supplied framed as this is safer for shipping and allows you to frame to suit your style, room and decor. Each is personally signed by me, with the name of the print and the edition number (the signatures on the paintings in the Shop and the edition number, shown to be 3/50 are for illustrative purposes only). Each also comes with a Certificate of Authenticity. What is a Giclée print and why is the distinction from other prints important? ​The Advantages : Giclee prints are advantageous to artists who do not find it feasible to mass produce their work, but want to reproduce their art as needed, or on-demand. Once an image is digitally archived, additional reproductions can be made with minimal effort and reasonable cost. The prohibitive up-front cost of mass production for an edition is eliminated. Archived files will not deteriorate in quality as negatives and film inherently do. Another tremendous advantage of giclee printing is that digital images can be reproduced to almost any size and onto various media, giving the artist the ability to customize prints for a specific client. Where archival dye-based ink sets exhibit excellent color gamut, pigment inks excel in permanence. A dye is molecularly soluble in its vehicle, but pigment is not. Pigment particles tend to be large enough to embed into the receiving substrate making them water-resistant. The particulate nature of pigment inks ensures their archival superiority. A particle of pigment is less susceptible to destructive environmental elements than a dye molecule. Many digital papers have coatings which enhance color gamut. However, these delicate coatings are susceptible to scuffing and scratching, and diminish the archival properties of the print. Prints made with coated substrates are not considered true digital pigment prints. Considering the above factors, we define a digital pigment print, sometimes referred to as a pigmented paper print, as a digital image rendered onto an uncoated, natural fiber substrate with pigment inks. ​Canvas prints can make a great statement in a room, don't require framing and are ready to hang! All my canvas prints are created from my original watercolours. 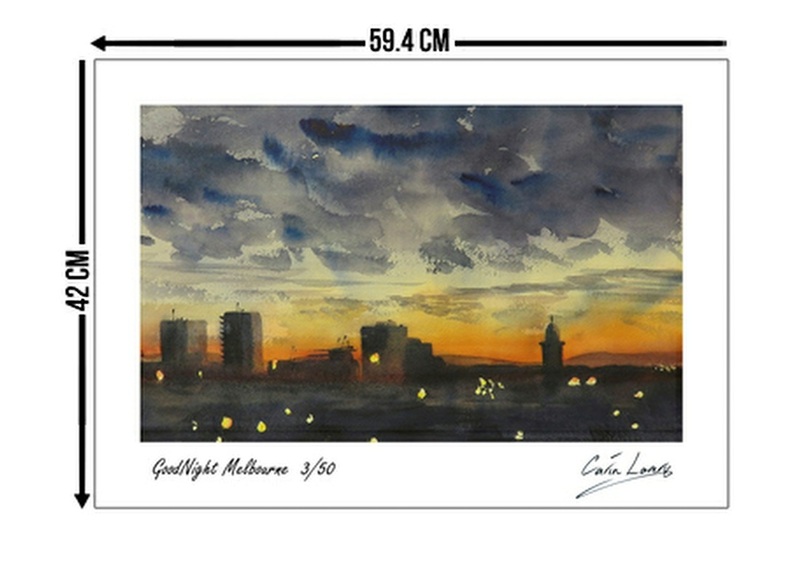 They're light in weight and are a practical choice for big bold artwork, whether abstract, landscape or illustration. They're great fun - and safe - for children's bedrooms and make wonderful gifts. 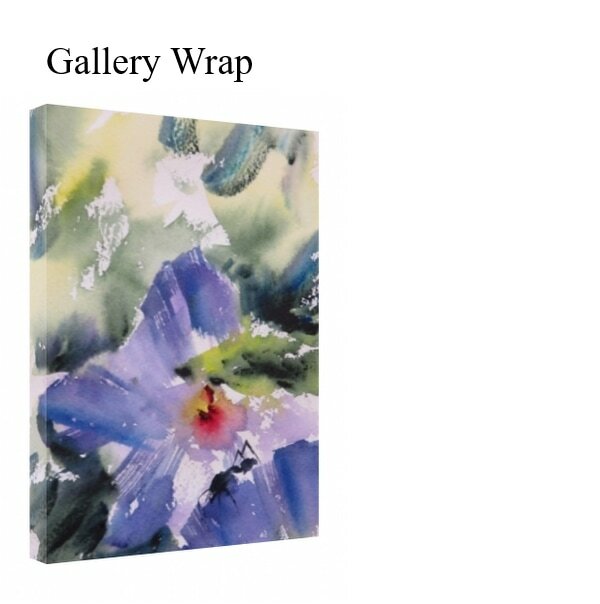 My canvases are delivered direct from my canvas supplier and are therefore unsigned. I mail your Certificate of Authenticity separately. My artwork is printed on 360gsm matte cotton stretched canvas over a durable 3cm thick wooden frame, with UV-resistant ink using modern and colour-correct printing technology. 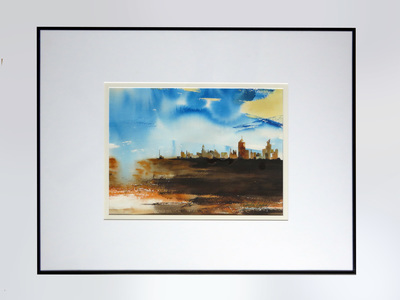 The frame is made from durable thick wood, which prevents the canvas from bending. 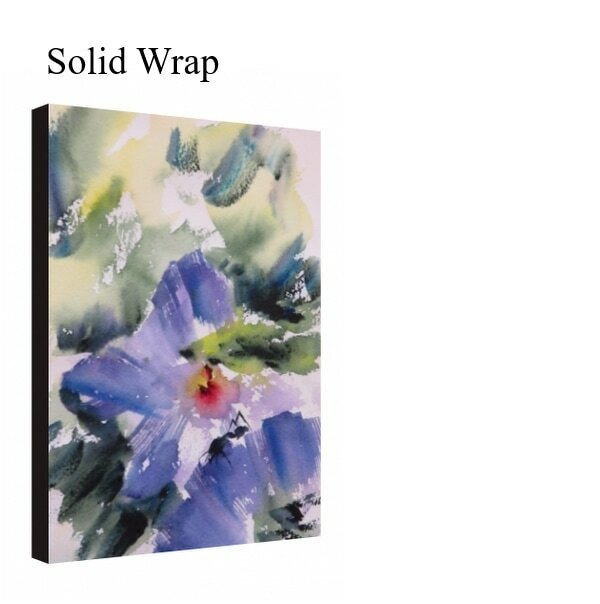 Most of my canvases have a 'gallery' wrap, meaning that the print wraps itself around the sides of the canvas as well, extending the length of the image. Occasionally, they will have a 'mirror' or 'solid' wrap instead, due to the shape of the painting that's being printed and where the image sits. The mirrored edge copies about 2 inches from the side of the image and prints it as a reversal (mirrored effect) on the sides of the canvas, the solid edge features a solid colour wrapping around the canvas. See below for examples. I've tried to think about all the information that you might wish to see, including the small detail and my policies. I encourage you to read these, particularly the Shipping and Returns Policy before purchase.